To me cloud – or better: as-a-Service – offers businesses one fundamental solution: It’s shifts the responsibility of (designing, buying, building and maintaining) an IT service to another company. They’re consuming a service and pay for that service, they don’t care what technology is behind that service. What business do care about if is the service is available, secure and reliable. If this comes at a cost it will be considered. Let’s take this home. I’ve been working in IT my entire professional career. I’ve learned my lessons, went to college and gained years of experience. Customers paid good money for my services. But I’m not good at building a house or painting. I can do it for sure, but I’d rather pay someone who’s good at it. It will cost me more money if I pay a painter for sure, but I know that it will look good in the end. Is cloud the answer to their misery? 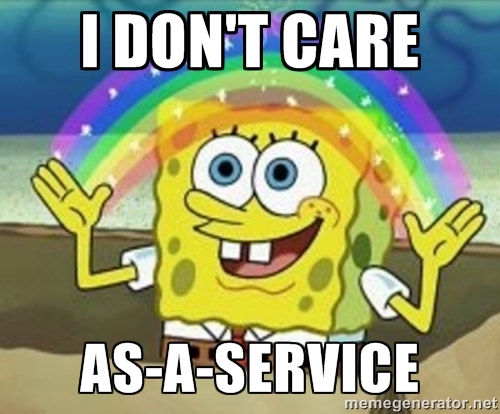 Probably not (new challenges are ahead for sure) but as-a-Service is. It’s happening, companies are moving services from their premises to a cloud. A few years ago every company had their own mailserver (mostly Microsoft Exchange, some Lotus Notes), because they need to communicate via e-mail. With Microsoft offering Exchange Online (or Office 365) a lot of customers are reconsidering their objectives. Do I need to design, build and maintain my own Exchange server…. or should I pay some money to Microsoft and consume a service? Do I really care what version I run? There was another trend when cloud entered the hyper cycle: consumerization of IT. Employees of companies are demanding that the same experience they have at home. They choose how and when they work, theres an increase of people who refuse to be dictated by IT how they should work. There’s a major shift happening and – even though IT organisation try – they can’t keep up with the pace. The result is utter chaos, it’s a mess. The easiest way for companies to address this is to outsource services so they no longer have to care how it’s done. Or better said, they’re no longer spending time in building, adapting and maintaining that services so they can focus on innovation. The more aaS-services they consume, the more they can focus on delivering services which are demanded by the business. So where business shift their focus to consuming services and adapting to changes, the IT industry’s focus should be about simplification: making it easier to consume IT services. And it’s happening for sure, but the pace is slow. There are too many old values, dinosaurs and conservatism. Trends like automation, orchestration, software-defined, hyperconverged and cloud are aimed to simplify IT. It’s not for free, but it’s cost vs value. 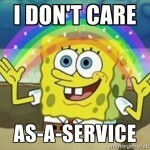 Companies are willing to pay money for “I don’t care how its done as-a-Service” and focus on their core business. In some cases this is achieved in the premises of the customers datacenter by implementing a software-defined (hyper)converged solution which is (fully) automated and orchestrated. Turnkey solutions are they key (pun intended) to the success of on-premises IT. Here’s a bold statement: Within 10 years > 50% of companies have no datacenter. Everything which now runs in the datacenter is moved to different services offered from “clouds”. The number of data, machines, bits and bytes that live in the datacenter is getting less every day. Hardware vendors are dinosaurs, hypervisors are commodity, technical specialists will become directors. Consultants will be consultants.